I am writing to express my grave concern about the passage of the Computer Implemented Inventions Directive (CIID) through the European Parliament and Commission. First, I have serious problems with the legislation as drafted. As a software developer myself, you might expect me to be supportive of patenting of software, and welcome the additional protection available to my work. It seems clear to me, however, that this directive will allow a wide range of software methods and processes to be patented, including many which are either "obvious" or over-broad. The financial burden of applying for and maintaining a patent is often beyond small companies, the cost of licensing is often prohibitive, and the cost of defending oneself against a patent violation claim is even greater. This makes life difficult for small companies to compete in the software development marketplace, and serves to further entrench the positions of incumbents, and stifle competition. You may have already seen the FFII's excellent and informative "Web Shop Patent Page" at webshop.ffii.org; if not, it is well worth five minutes. This shows the EU patents already granted on virtually all of the simple and obvious elements of a retail web page. Even if, as some have suggested, the directive is designed only to regularize existing practice, and can be limited only to that effect, the web shop example shows quite graphically the chilling effect it will have. At work and at home, I also rely on free and open-source software (FOSS). This directive affects FOSS projects punitively, since the licensing of patents is often incompatible with the software licenses involved. FOSS projects are a source of significant revenue in the EU, both for companies developing them (for example, France's MandrakeSoft), and those people using them (for example, the regional Health Service of Extremadura, Spain, has just announced a plan to roll out open-source software to 14,000 users). Second, the progress of this item has been very irregular. There have been many apparent fudges of process and procedure during the passage of this legislation through the EU Parliament and Commission; online press coverage has been thorough, and I wish only to highlight two of the grossest points. The legislation was initially criticised, and then suddenly introduced as an A-list item on the Council of Ministers of Agriculture & Fishery agenda on 28 February. This seems like a very odd place to put an item which would seriously affect the tech sector, and the Polish delegate had the item stopped on a point of procedure. Further, when reviewed again, the JURI Committee voted almost unanimously to restart, which was followed by a unanimous request for the same by the Parliament. However, the Commission has refused to restart the drafting of the legislation, against published rules of procedure. The minister from Luxembourg who chaired the meeting said: "We are adopting this Common Position today for institutional reasons as not to create a precedent". This is, in my view, insufficient justification for the passage of such a potentially damaging piece of legislation. The directive now goes back to the parliament, and needs a full majority (367 votes against) to stop or amend it. In conclusion, then, as one of my elected representatives in Europe, I would ask that you actively vote on my behalf against this directive during the upcoming parliament session, and would also ask that you support an investigation of the highly suspect history of this item. These are the replies I have received so far, in the order I received them. Scans are 800x1100 JPEG, hopefully with a decent compromise between enormous size and readability. I have now had time to put all of these through OCR, so follow the links for plain text versions. One point I found interesting is that both the Green Party and UKIP strongly oppose the directive, despite being generally on opposite ends of the political spectrum. It goes to show that one can find allies in the most unlikely places! Thank you very much for your email regarding your concerns about the European Union's Computer Implemented Inventions Directive. 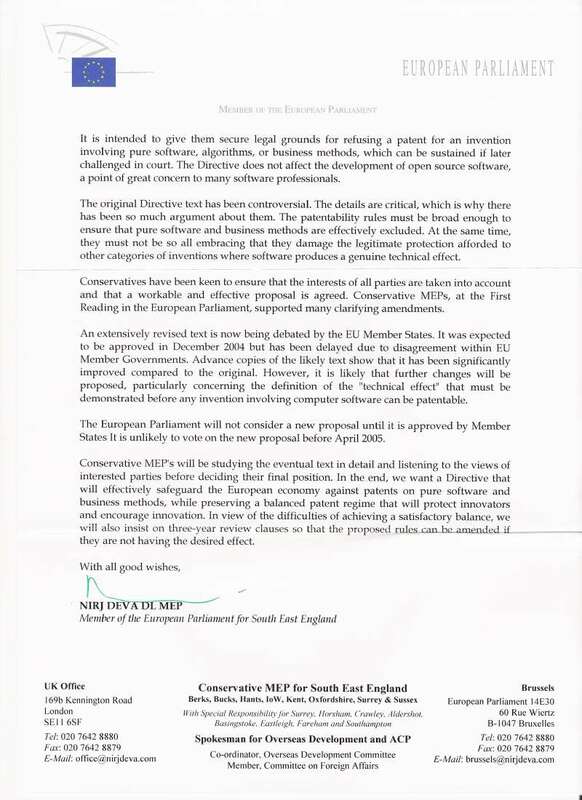 I am replying on behalf of all four Conservative MEP's for the South East. Conservatives have consistently supported the need for the European Union to have a clear patent regime that excludes computer sofware and business methods from patentability. This will reinforce the EU's competitive position and give us a different regime from the US and Japan, wlere patents are being granted in both these areas. Doing nothing is not an option. European Patent Offices are already dealing with applications for patents involving software in different ways in different countries. Therefore, the European Comission has put forward a Directive that is intended to lay down c1ear ru1es under which inventions including computer software can be considered eligible for patenting. This proposa1 Directive on Computer Implemented Inventions is not intended to extend existing European Patent Law into any new areas. It is designed to give patent inspectors an unambiguous legal framework within which they can make judgements on the patentability of inventions containing computer software. It is intended to give them secure legal grounds for refusing a patent for an invention involving pure software, algorithms, or business methods, which can be sustained if later challenged in court. The Directive does not affect the development of open source software, a point of great concern to many software professionals. The original Directive text has been controversial. The detai1s are critical, which is why there has been so much argument about them. The patentability rules must be broad enough to ensure that pure software and business methods are effectively excluded. At the same time, they must not be so all embracing that they damage the legitimate protection afforded to other categories of inventions where software produces a genuine technicnl effect. Conservatives have been keen to ensure that the interests of all parties are taken into account and that a workable and effective proposal is agreed. Conservative MEPs, at the First Reading in the European Parliament, supported many clarifying amendments. An extensively revised text is now being debated by the EU Member States. It was expected to be approved in December 2004 but has been delayed due to disagreement within EU Member Governments. Advance copies of the likely text show that it has been significantly improved compared to the original. However, it is likely that further changes will be proposed, particularly concerning the definition of the "technical effect" that must be demonstrated before any invention involving computer software can be patentable. The European Parliament will not consider a new proposal until it is approved by Member States It is unlikely to vote on the new proposal before April 2005. Conservative MEP's will be studying the eventual text in detail and listening to the views of interested parties before deciding their final position. In the end, we want a Directive that will effectively safeguard the European economy against patents on pure software and business methods, whi1e preserving a balanced patent regime that wi11 protect innovators and encourage innovation. In view of the difficulties of achieving a satisfactory balance, we will a1so insist on three-year review clauses so that the proposed rules can be amended if they are not having the desired effect. My assessment: The Conservatives seem uncommitted. I would not be surprised if they abstain. 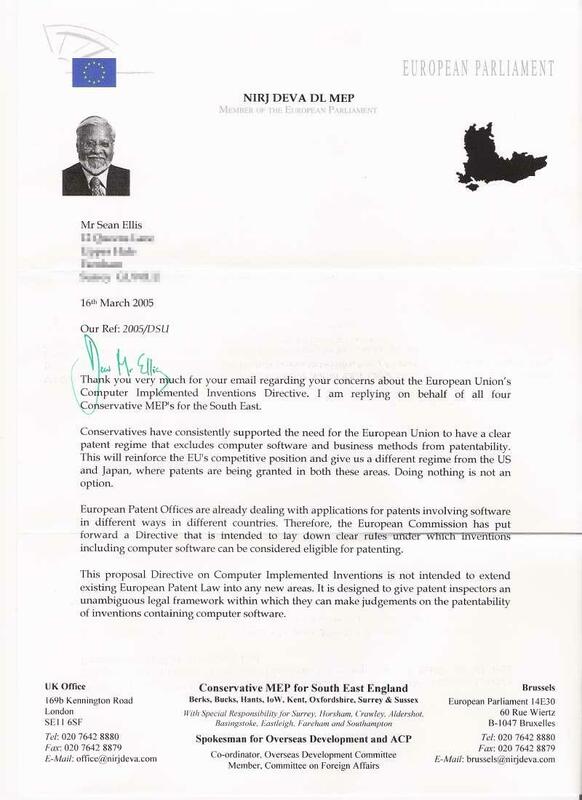 Many thanks for your letter regarding the Computer Implemented Inventions Directive. You are far from being alone in your views on this issue; I have received many other letters like yours, and fully share your concerns. The directive as adopted by the Council on Monday 7 March is not acceptable - either on grounds of reason, or of the threat it poses to innovation, competition and small entrepreneurs. 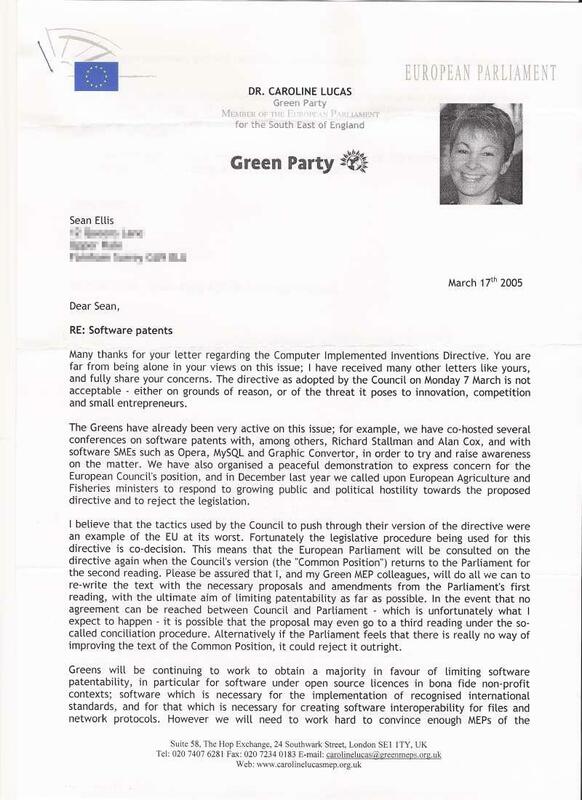 The Greens have already been very active on this issue; for example, we have co-hosted several conferences on software patents with, among others, Richard Stallman and Alan Cox, and with software SMEs such as Opera, MySQL and Graphic Convertor, in order to ty and raise awareness on the matter. We have also organised a peaceful demonstration to express concern for the European Council's position, and in December last year we called upon European Agriculture and Fisheries ministers to respond to growing public and political hostility towards the proposed directive and to reject the legislation. I believe that the tactics used by the Council to push through their version of the directive were an example of the EU at its worst. Fortunately the legislative procedure being used for this directive is co-decision. This means that the European Parliament will be consulted on the directive again when the Council's version (the "Common Position") returns to the Parliament for the second reading. Please be assured that I, and my Green MEP colleagues, will do all we can to re-write the text with the necessary proposals and amendments from the Parliament's first reading, with the ultimate aim of limiting patentability as far as possible. In the event that no agreement can be reached between Council and Parliament - which is unfortunately what I expect to happen - it is possible that the proposal may even go to a third reading under the so- called conciliation procedure. Alternatively if the Parliament feels that there is really no way of improving the text of the Common Position, it could reject it outright. Greens will be continuing to work to obtain a majority in favour of limiting software patentability, in particular for software under open source licences in bona fide non-profit contexts; software which is necessary for the implementation of recognised international standards, and for that which is necessay for creating software interoperability for files and network protocols. However we will need to work hard to convince enough MEPs of the importance of this issue, and will need every possible support from outside the Parliament to do so. If you would like more detailed information and news on European Green policies and activities in the field of free and open source software and software patents, please visit http://lists.collectifs.net/cgi-bin/mailman/listinfo/greensource where you can subscribe to the mailing list Greensource. May I take this opportunity to thank you again for your support on this matter, and to state once more my commitment to doing all I can to fight the cause. 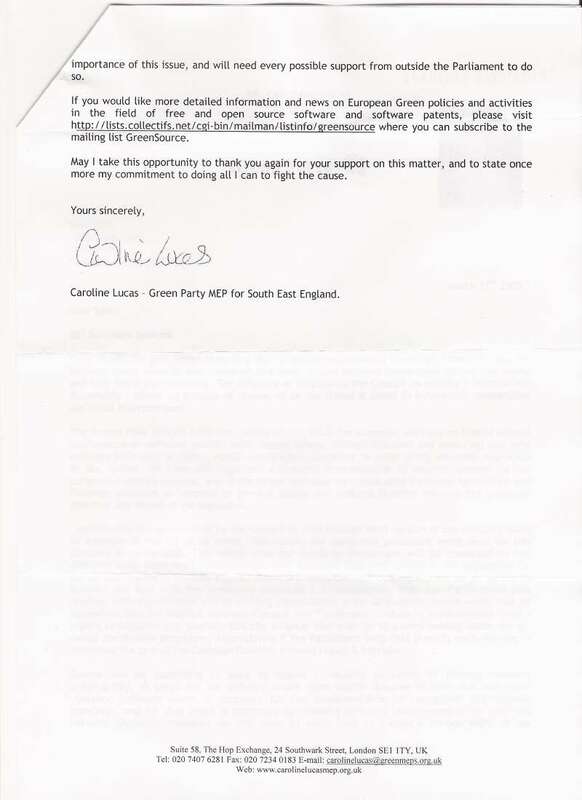 Caroline Lucas - Green Party MEP for South East England. My assessment: The Green Party appears to be staunchly against this legislation. Thank you for your letter regarding the above, one of a considerable number we have received on this subject. It appears that this legisation is being proposed for the benefit of large, often multi-national, companies and not for the benefit of smaller businesses or individuals. Mr Farage and his UKIP MEP colleagues will be opposing the legislation and will contact the Commissioner responsible with your concerns. My assessment: UKIP also seem to be strongly against. 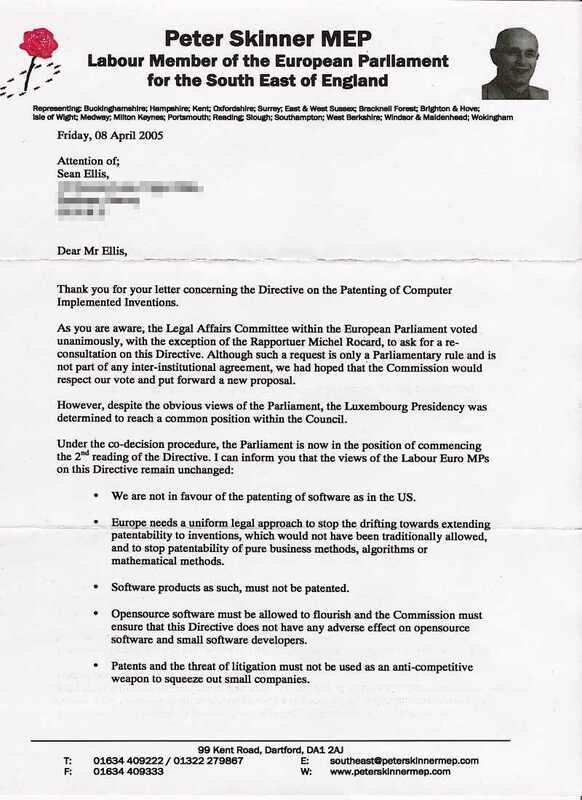 Thank you for your letter concerning the Directive on the Patenting of Computer Implemented Inventions. As you are aware, the legal Affairs Committee within the European Parliament voted unanimously, with the exception of the Rapportuer Michel Rocard, to ask for a re- consultation on this Directive. Although such a request is only a Parliamentary rule and is not part of any inter-institutional agreement, we had hoped that the Commission would respect our vote and put forward a new proposal. However, despite the obvious views of the Parliament, the Luxembourg Presidency was determined to reach a common position within the Council. Under the co-decision procedure, the Parliament is now in the position of commencing the 2nd reading of the Directive. I can inform you that the views of the Labour Euro MPs on this Directive remain unchanged. We are not in favour of the patenting of software as in the US. Europe needs a uniform legal approach to stop the drifting towards extending patentability to inventions, which would not have been traditionally allowed, and to stop patentability of pure business methods, algorithms or mathematical methods. Software products as such, must not be patented. Opensource software must be allowed to f1ourish and the Commission must ensure that this Directive does not have any adverse effect on opensource software and small software developers. Patents and the threat of litigation must not be used as an anti-competitive weapon to squeeze out small companies. 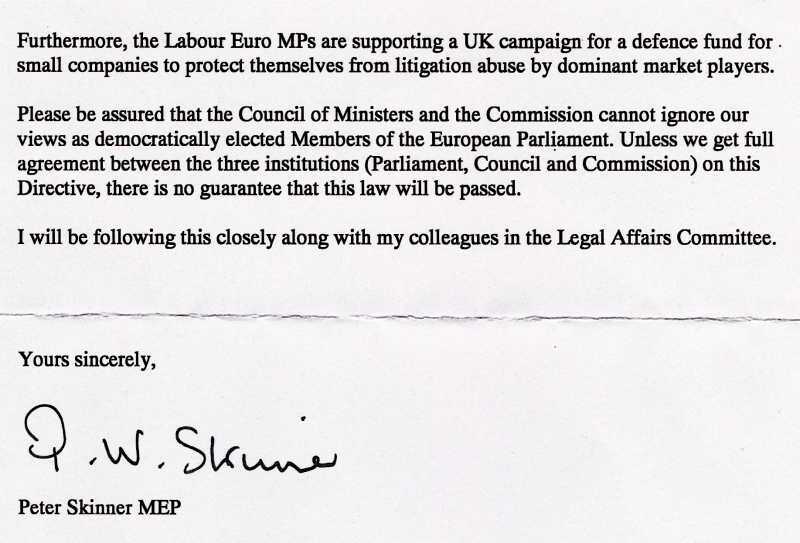 Furthermore, the Labour Euro MPs are supporting a UK campaign for a defence fund for small companies to protect themselves from litigation abuse by dominant market players. Please be assured that the Council of Ministers and the Commission cannot ignore our views as democratically elected Members of the European Parliament. Unless we get full agreement between the three institutions (Parliament, Council and Commission) on this Directive, there is no guarantee that this law will be passed. I will be following this closely along with my colleagues in the Legal Affairs Committee. 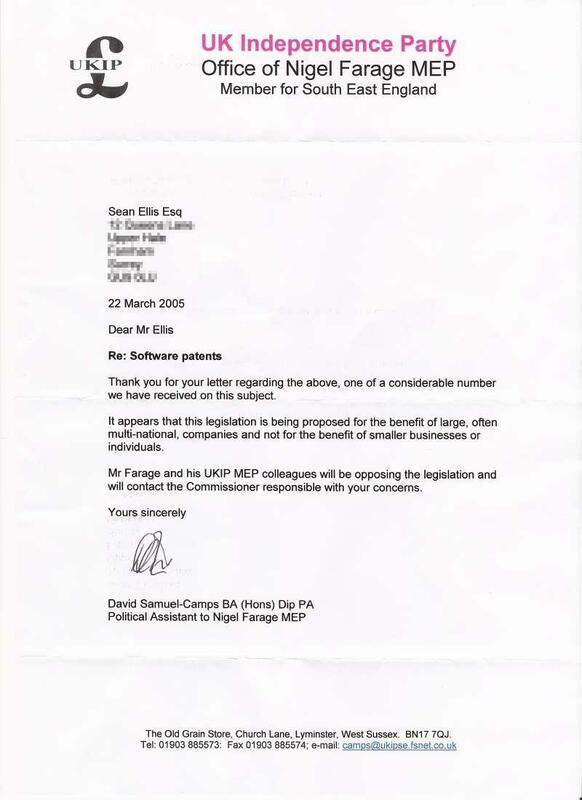 My assessment: Labour appear opposed, but apparently are not aware of the extent to which software can already be patented in the EU. Viewed 12875 times since 2007-01-20. Copyright ©2006-2014 Sean Ellis. All rights reserved. Hosted by Kernow Web Hosting.